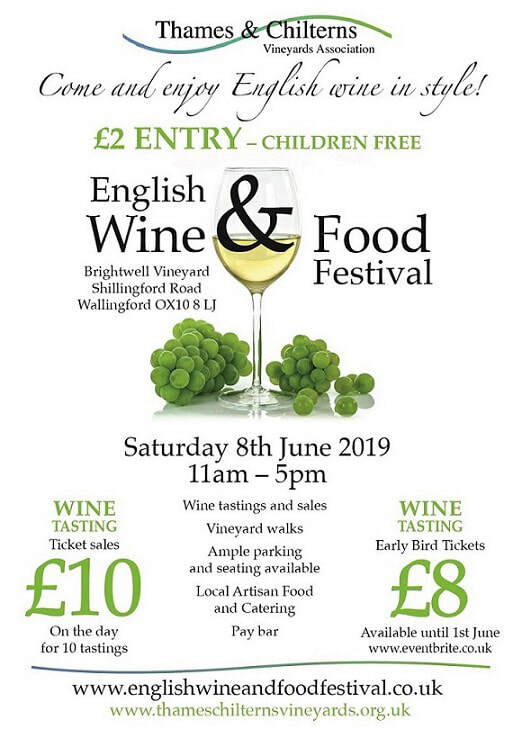 Vineyards in The Thames & Chilterns Region are toasting the bountiful 2018 harvest, by holding an English Wine & Food Festival at Brightwell Vineyard, Wallingford, OX10 8LJ on Saturday 8th June 2019, where members of the public will have the unique opportunity to taste, compare and buy award-winning local wines in one beautiful location. Wine tastings, vineyard walk and local artisan food and craft suppliers will make this a lively, informal and informative afternoon - a real celebration of the wonderful variety of wines and food that the Thames & Chilterns Region has to offer. Activities: wine tastings and sales, vineyard walk, meet the producers, local vineyard information, local artisan hot and cold food, pay bar, local crafts. 25 May 2018 Press Release - Bothy Vineyard, Oxfordshire’s oldest vineyard-winery turned 40 years in 2018. There are several reasons for celebration. Besides turning 40, Bothy Vineyard had just successfully bottling its 2017 Vintage. After several years of being hit by late frosts, the vines came through this cold winter and spring with virtually no frost damage. ​Saturday 25 and Sunday 26 May (11-6). The vineyard will be open to the public to explore and enjoy. Meet the winemaker, free wine tastings and short tours at 11 and 3 pm on each day. Picnics and well behaved dogs are welcome. Book now for a personal and informative 2 hours tour of the vineyard. The season starts towards the end of April and end in September. Drop in Tour dates will take place at 2 pm on the last Saturday of each month from April to September. Please ring to make sure you have a space tel: 01865 390067. If you would like to organize your own tour or join an existing tour booking, click h﻿ere for more information. ​Bothy Vineyard has found a way of making corks work harder. Besides using corks to stopper their own wines, this local vineyard is now collecting its used corks and passing them onto Recorked UK, a cork-recycling programme that then donates a penny for every cork collected to a local wildlife charity. Bothy Vineyard is Oxfordshire’s official collection point, having sent over 7000 corks to Recorked UK. There is a huge UK demand for this wonderful natural material, which is not currently being met. The White Hart at Fyfield, Cherwell Boathouse and the Oxford Wine Company are just some businesses that have agreed to give their old corks to this cause. Can your business do the same? Bothy Vineyard has always placed a huge emphasis on sustainable practices – recycling, re-using, energy conservation and wildlife protection. However this is the first time that a real opportunity has arisen to save corks from landfill.